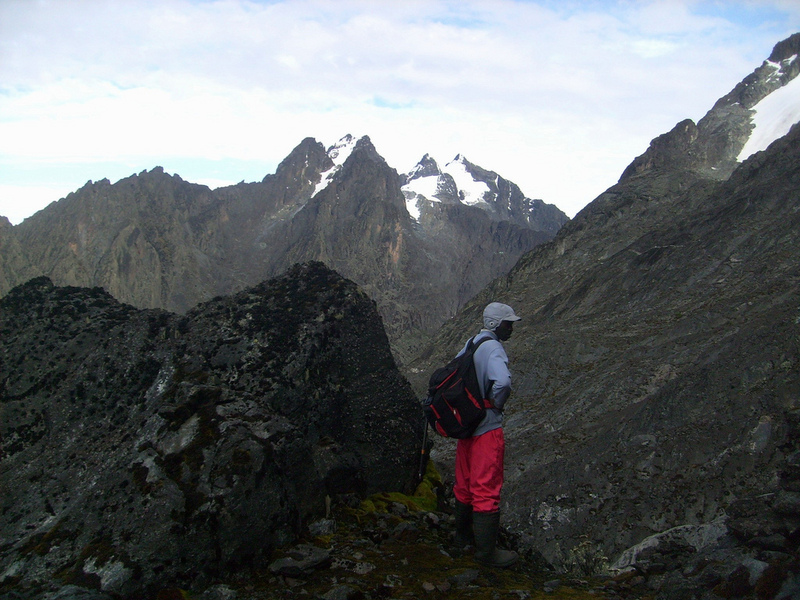 This route starts from the Kitandara hut, elevation about 4000 meter and location N00:20.945, E029:53.212. The trail (which is part of the general Margherita Circuit Trail) heads steeply uphill among dense vegetation. The first waypoint is Freshfield Pass where the Baker route forks left from the main trail. 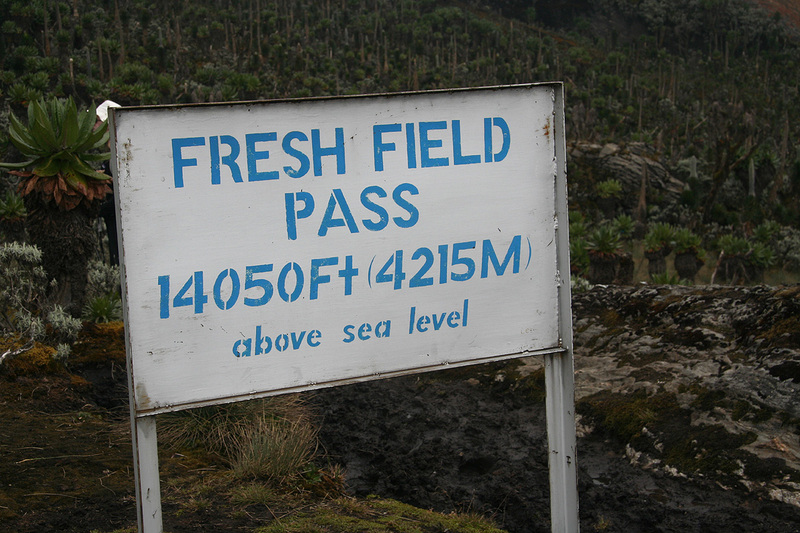 We reached this pass after 50 minutes, elevation about 4250 meter and location N00:20.849, E029:53.465. 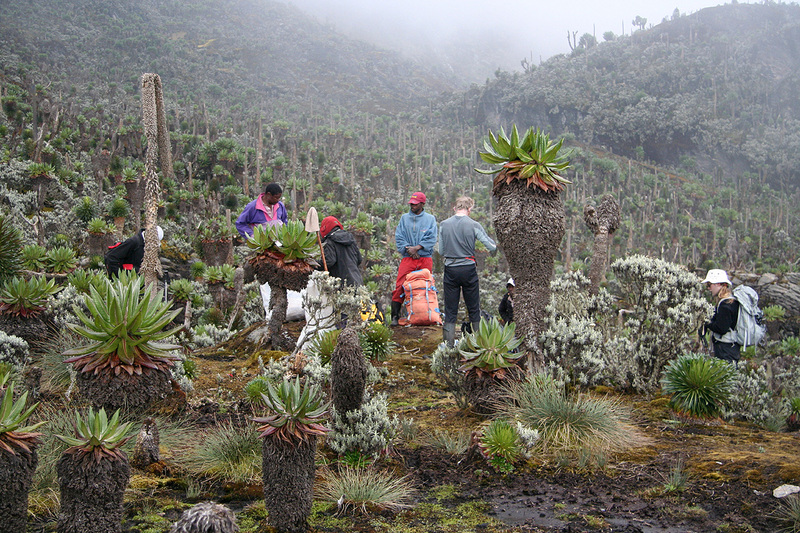 Locate a small climbers trail that heads off to your left. This trail is marked with small cairns and is not hard to follow. 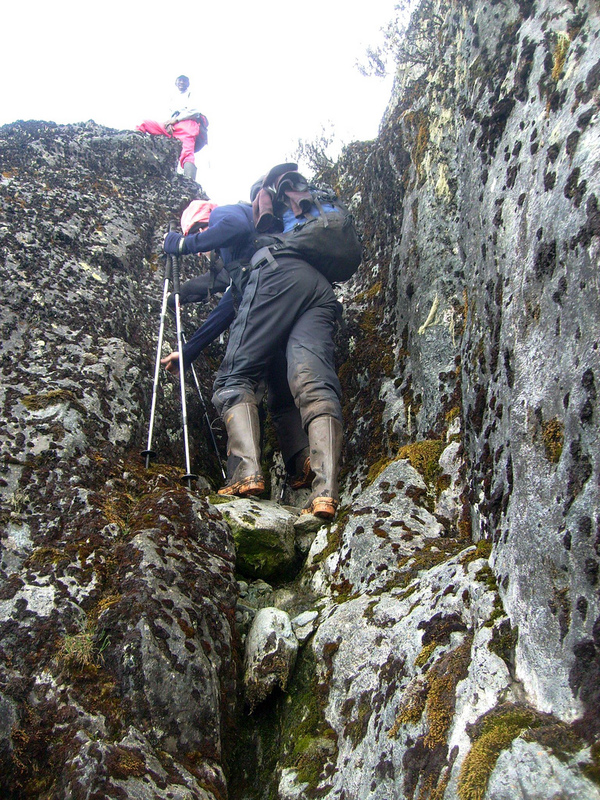 The trail leaves the mud behind and becomes more rocky with easy scrambling, the first section where hands are needed being a distinct V-shaped gully. 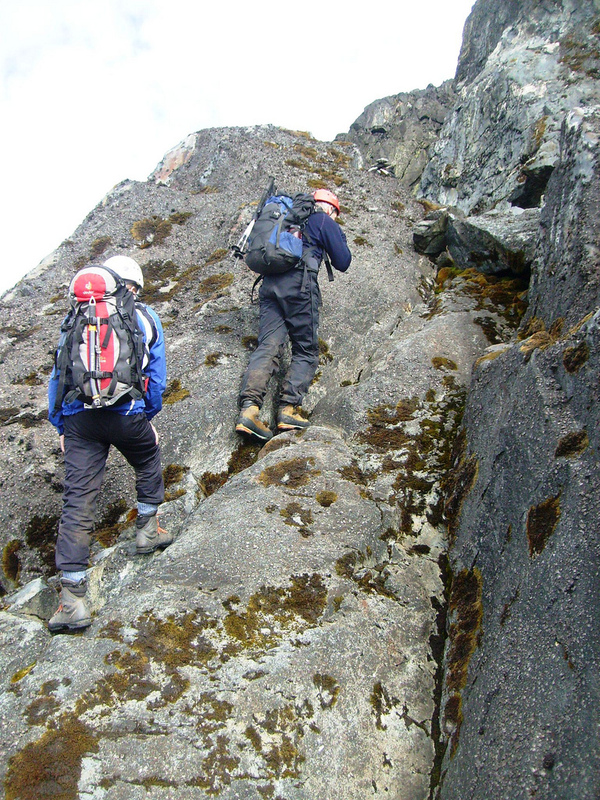 The route crosses a small notch, descends slightly on the other side, stays left of the first summit and continues with more scrambling. 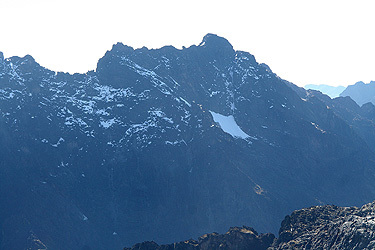 There are two variations higher up, one route continues well left of the main ridge line, an alternative stays slightly higher, but still generally below the very jagged ridge. 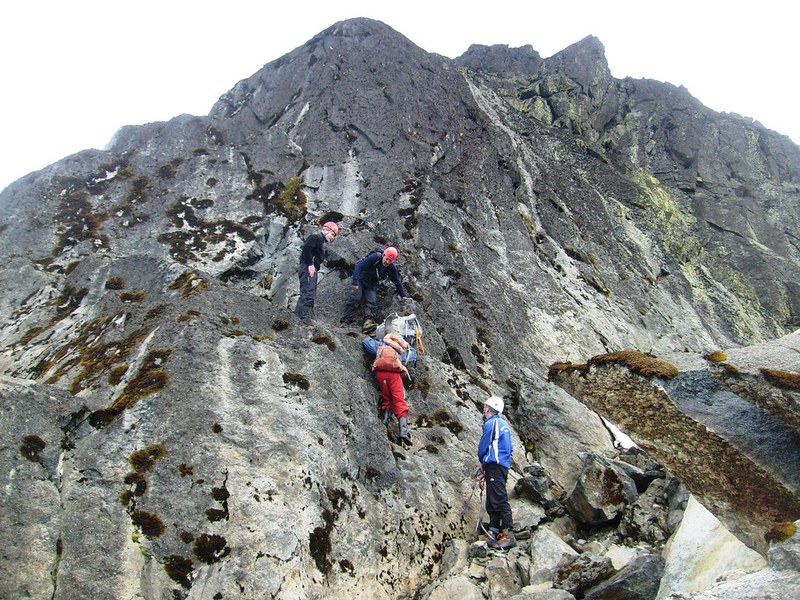 The scrambling sections becomes more frequent as one moves higher, but each pitch is quite short with good holds, typical YDS class 3 terrain. One should be aware that this route may become considerably more difficult when wet. Eventually, one arrives at a narrowing ledge that descends and turns into a narrow crack. One must downclimb this in order to reach a snow filled gully. 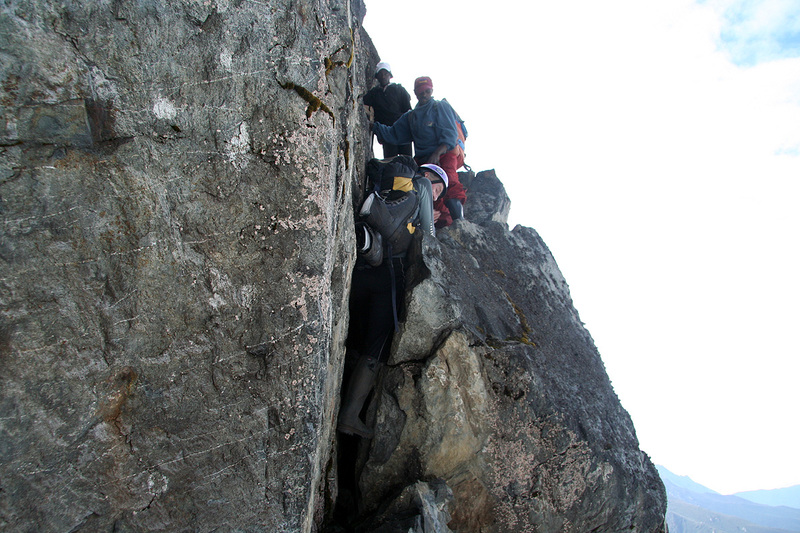 This downclimb is not very hard, there are good holds and one can preferably stay outside of the narrow crack. The steep part is less than 5 meter. The snow gully is not very steep, but with hard snow one should at least carry an ice axe for making a few steps across. 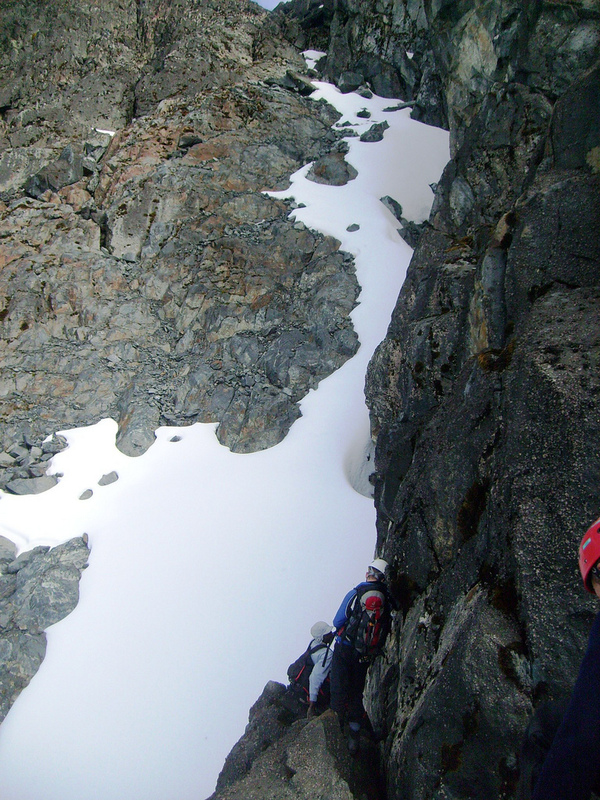 From here, there is easy scrambling on slabs and ledges (not very steep) towards the local col above, thereafter an easy traverse left in order to gain the proper summit. Comments / Trip Report: I did this climb with my two sons, Tor Erling and Pål Jørgen, plus my friend Rob Woodall. 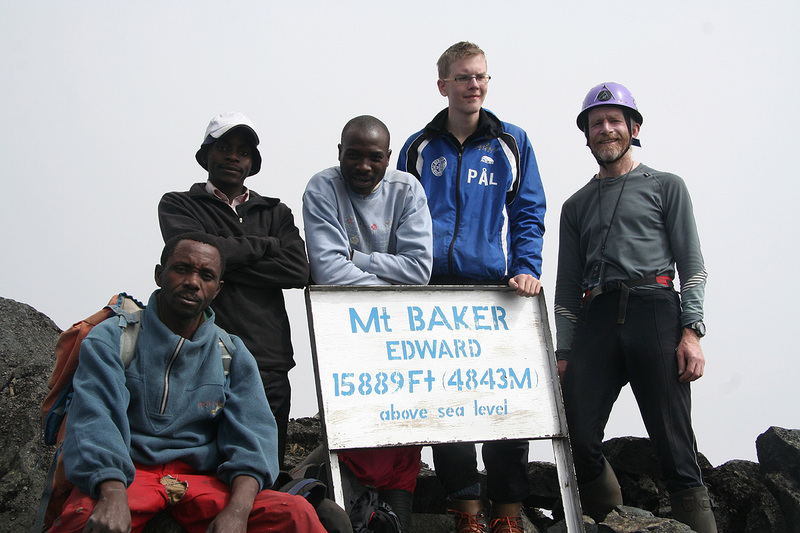 We also had our two local guides, George and Sebestian come along. 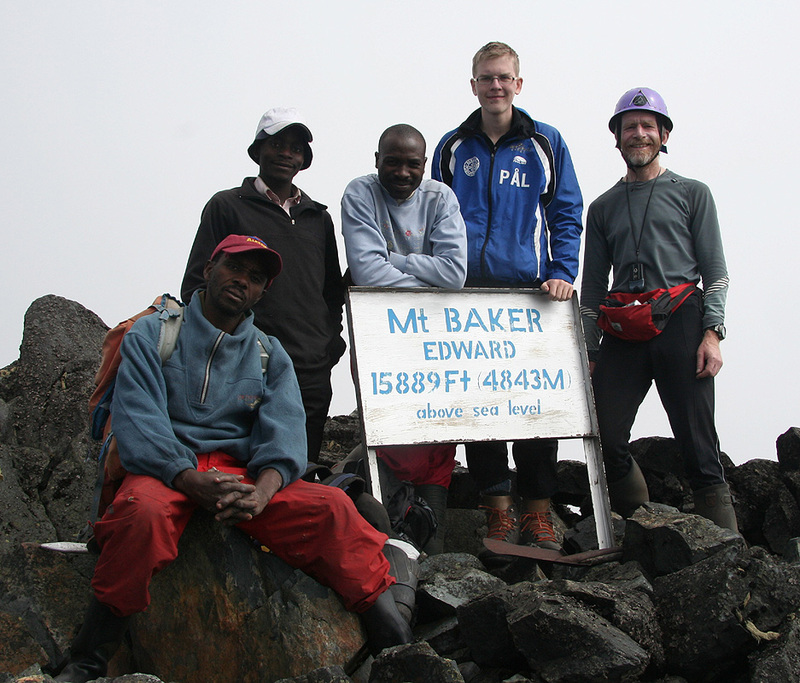 We started out from the Kitandara hut around 0710 and reached the summit at 1045. 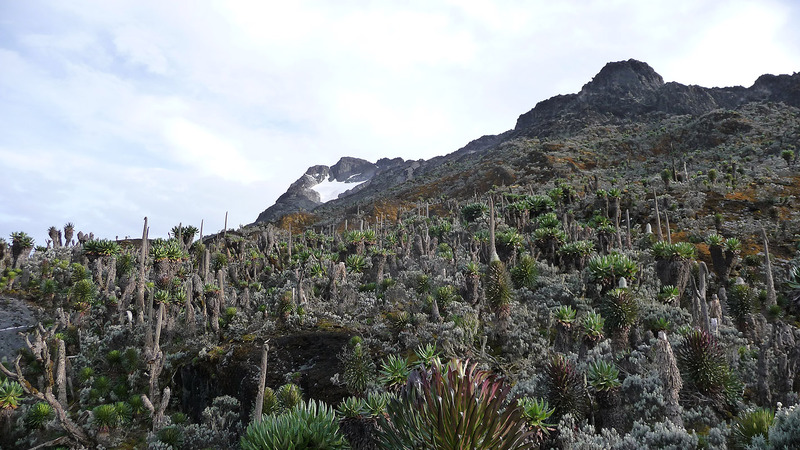 We had sunshine on arrival, but pretty soon the first clouds started to engulf the summit area. We had a nice look across to Margherita and captured a few teams on its glacier by our cameras. Tor stopped at what turned out to be the most exposed scrambling section, while the three of us continued to the summit. The designated crux of this route turned out to be considerably easier than anticipated. We left the summit at 1100 and descended back down to Freshfield Pass by 1300. Here, porters were waiting and we continued our trek to the Guy Yeoman hut. 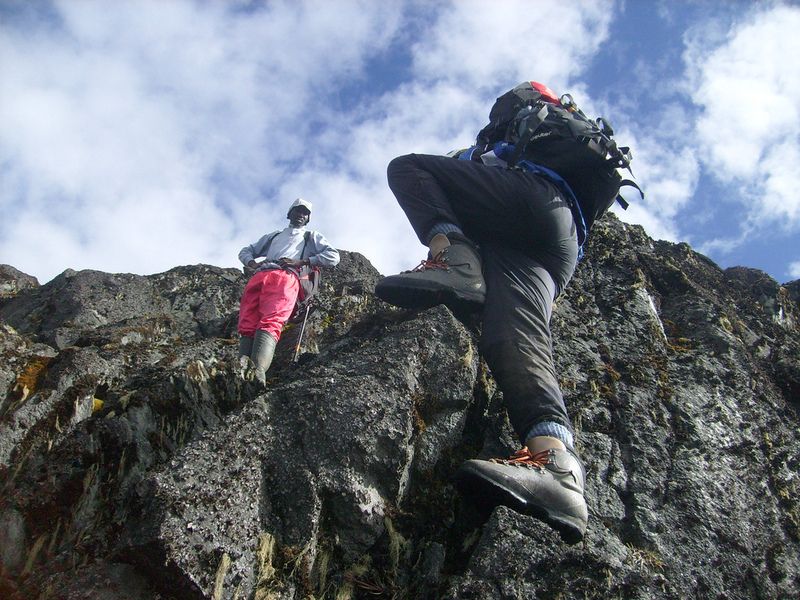 Thanks also to our guides George and Sebestian, also our cook, Limbali Ambrose came along all the way to the summit.